5-10 mins: in a pressure cooker, heat the oil, add the bay leaves and star anise, stir for a few seconds till it gives out the aroma. add the sliced onion and green chillies and fry till golden. add the tomato puree, turmeric, salt and cook for a few minutes, stirring a bit. 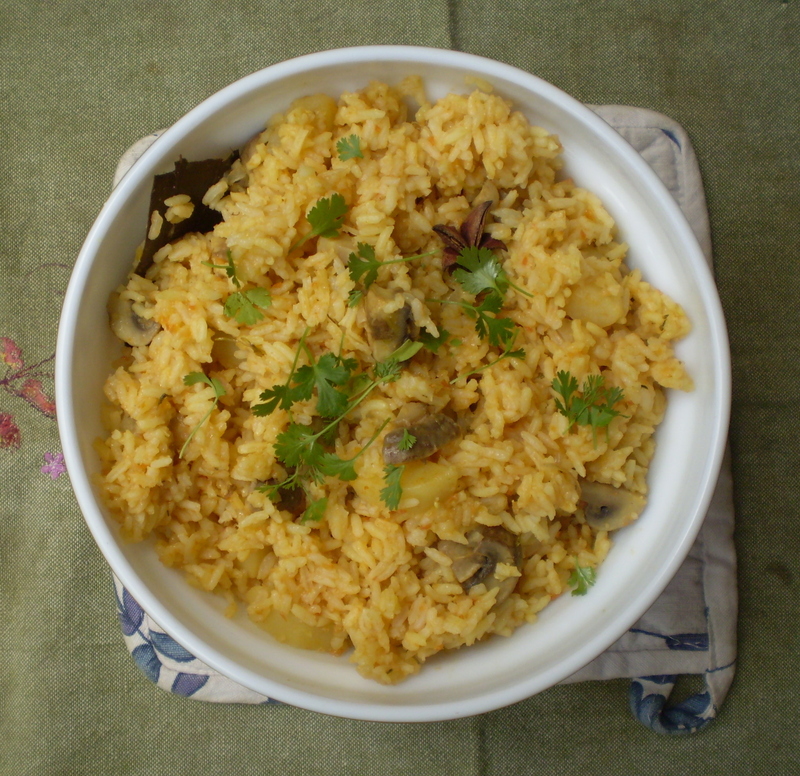 add the chopped potato and mushrooms, add the washed drained rice, 1 1/2 cup water. check for salt and adjust. 10-20 mins: close the cooker, wait for 2-3 whistles and turn off. while you wait for the pressure to release, set the table, whip up the curds for the accompaniment. when the cooker can be opened, mix the rice a bit, put into a serving dish, garnish with fresh coriander and serve hot with curds raita and pickle. a filling meal in less than 20 mins. wow! i didnt know u had a cooking blog. or did i? 20 mins meal looks wonderful. thanks! !it was funny to hear how u ended up tonees of veggies! Life saver it sure is…this and more of its ilk!! yummy rice dish. Great entry to two great events. Thanks for sharing. thanks Asha, its also one of the most fuss free things i have made….especially when guests pop in and decide to stay for a meal! !